If you haven’t heard by now, sleep is one of the most important things in life. Period. The regulation of which contributes to a seemingly infinite, and therefore extremely wide-ranging list of medical metrics, and impacts on overall health. So, it’s no wonder people and companies alike are searching for newer, more efficient, and accurate ways to not only track their sleep, but improve it by doing so. Unfortunately, the most popular sleep trackers on the market are those found on general activity trackers and smart watches, which often treat sleep tracking in a very generic, cookie-cutter fashion, offering little if anything in the way of improving user’s sleep. That’s where devices like these come in. Attempting to build a bridge between data and action, these trackers use unique, often highly-refined methods to track your sleep while also endeavoring to fix it too. Without further ado, here’s your comprehensive guide to the most unique and effective sleep trackers on the market! The SleepScore Max is one of few non-wearable sleep trackers and is even more rare for the technology by which it functions. 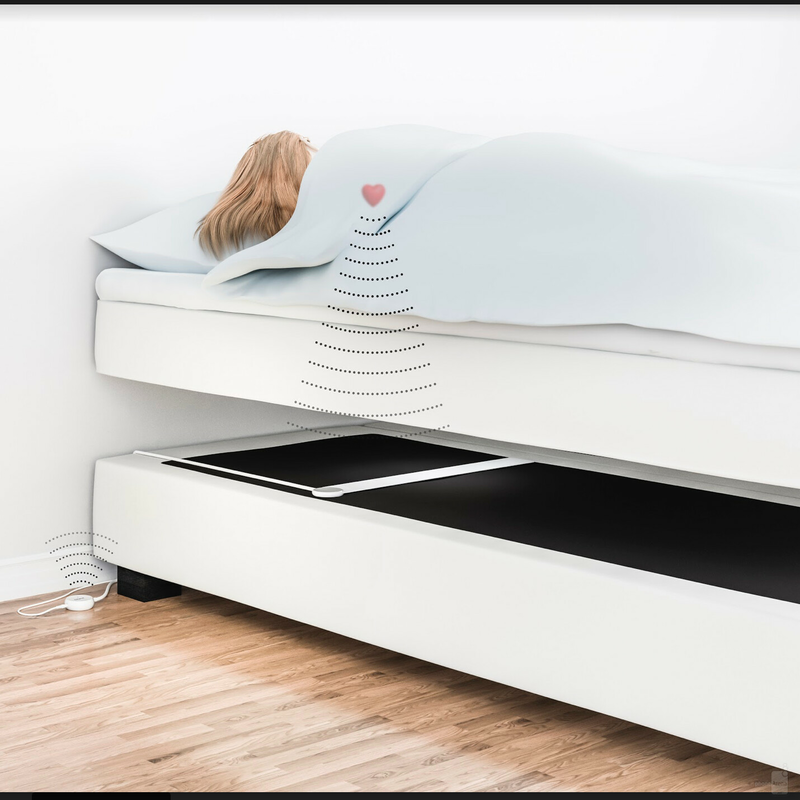 Utilizing a radio frequency sensor, the SleepScore Max scans for movement 16 times per second and can detect motion down to 1/10th of a millimeter. This is used to track respiration and body movement then processed to provide a breakdown of the users sleep quality and stages with up to 85% accuracy compared to polysomnography labs, the gold standard in sleep tracking and analysis. As if not having to wear anything weren’t good enough, the SleepScore Max sets itself apart further by providing active and pro-active tips tailored to the user for improving sleep quality. These can include recommendations on methods, diets, and habits for better sleep as well as devices and sleep programs that SleepScore Labs has found to improve sleep scores for other users with similar profiles. All of this is based on your sleep patterns, age, and questions answered in the setup survey used to profile your sleep habits and conditions. Unfortunately, continuously tailored advice is rare in the sleep tracking world, which, after a while, can leave users wondering just what they’re tracking for, so having such constant feedback is a huge plus. Developed as a joint venture between Dr. Mehmet Oz, a medical device and research company by the name of ResMed, and private equity firm Pegasus Capital Advisors, L.P. SleepScore Labs released the SleepScore Max as an easy-to-use, highly-accurate alternative to wearable sleep trackers. Forged from over 10 years of development and over 25 years of research in sleep and respiration, the SleepScore Max may easily have one of the deepest backgrounds in sleep medicine and the sleep tracking world. ResMed S+, $48.95 - Preceding SleepScore Labs' SleepScore Max, its parent company ResMed released a consumer tracker called the ResMed S+. Offering sleep tracking through similar sonar-like technology, the ResMed+ also endeavors to improve sleep by going beyond tracking and doling out personalized tips to improve sleep. Being a first-generation of sorts for the SleepScore Max, accuracy has likely been improved upon in the Max, however if you're a believer in the proven efficacy of this contactless form of tracking then the ResMed S+ can be a cheaper alternative with many of the same benefits. The Dreem headband takes a more hands-on approach in tracking your sleep and also improving it. Dreem uses bone conduction and slight auditory stimuli to track and influence your sleep in various stages. While EEG (brainwave) sensors track your stages of sleep, back sensors consisting of an accelerometer and pulse oximeter track respiration and heart rate to gather a complete understanding of your sleep quality. As a growing number of sleep trackers do, the Dreem aggregates your sleep information within a companion app and distills this data into personalized, actionable insights to improve your sleep quality. As mentioned, this device takes things a step further than just the tracking bit by exerting influence on your sleep throughout the night. Based on your EEG readings, the Dreem headband will determine when you’ve entered specific stages of sleep and emit auditory cues to help keep you in these stages more often and for longer periods of time. Sounds like magic, but it’s just good old (new?) fashioned science. All that magic does come at a price, though - $500 to be exact – but those serious about getting better sleep might consider trying out this unique approach. 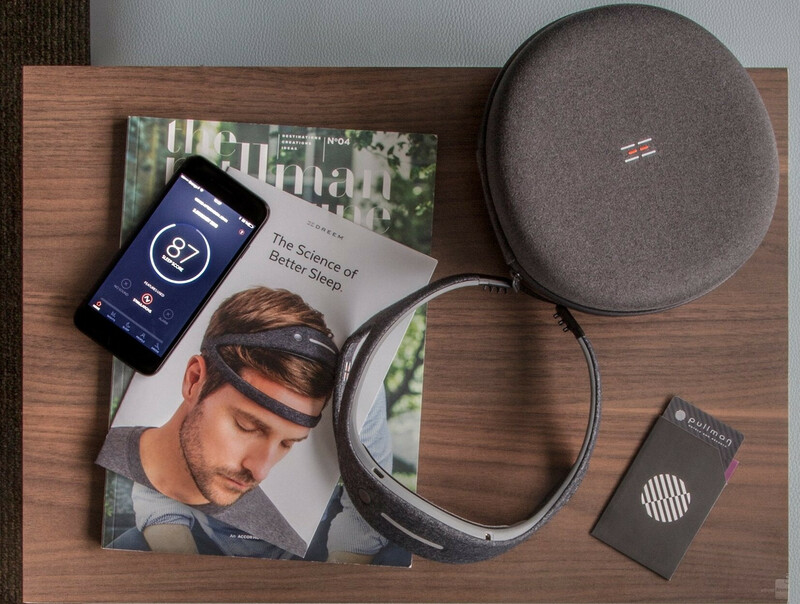 Neuroon Open, $299 ($199 on Indiegogo) – The Neuroon Open is an intelligent sleep mask which offers EEG analytics, heart rate, body temperature, sleep-phase detection, and Light Therapy to influence sleep stages and lucid dreaming. This sleep mask also offers sleep tracking and scores as well as personalized insights to improve sleep quality. Sleep Shepherd, $149 – This is another EEG-enabled tracker but instead of lights like the Neuroon Open, the Sleep Shepherd employs proven binaural beats frequencies to put the brain at ease and fall asleep quicker. EEG tracking informs the tailored frequencies, depending on what level of alertness your brain is at. This is the same mechanism by which the Sleep Shepherd’s smart alarm functions. Sleep isn’t influenced aside from this period of falling asleep, but basic sleep tracking will tell you your sleep phases and quality. Neither personalized insights to improve sleep are provided nor physiological metrics like heart rate and body temperature. Under-the-mattress trackers can be a good, straight-forward solution to sleep tracking. Among their advantages is the ability to track without wearing a device, and seamless “set-it-and-forget-it” automatic tracking. Trackers like Beddit have shown efficacy in tracking sleep stages and trends but the EMFIT QS+ ACTIVE steps things up another level by adding heart-rate-variability tracking. Heart-rate-variability is a metric used to determine overall health, as well as gauge activity and recovery rates/recommendations, especially in athletes. Essentially, a high heart-rate-variability is an indicator of good health and optimal fitness levels, while a lower HRV is associated with stress and fatigue. For athletes, keeping an eye on these levels can help to quantify their days work, avoid over-training, and ensure proper rest, while non-athletes can look to this metric for an indicator of their overall wellness and restfulness, both physically and mentally. Emfit uses your body movements and heart rate to help produce a graphical representation of your vitals and sleep efficacy in a technique called ballistocardiography. 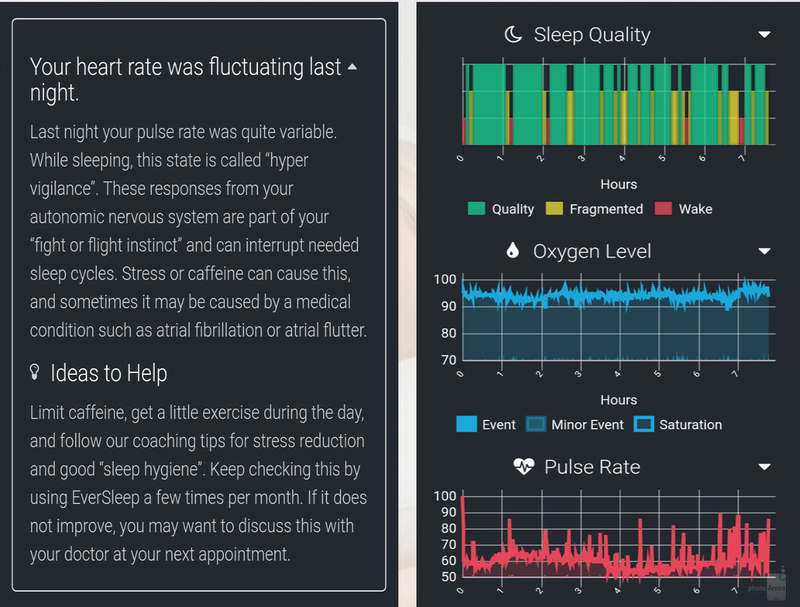 This not only produces visual aids to analyze your sleep stages (REM, deep sleep, light sleep, restfulness/tossing and turning) but also a comprehensive analysis of your HRV detailing restfulness, recovery, and general wellness. This is also quantified and easily viewable for reflecting long-term trends in addition to daily reports. While this companion app is no doubt data-packed, not a lot of tips are offered in the way of improving your sleep. Generally, for athletes, having low metrics in the devices analysis of your HRV can mean training lighter and focusing on getting proper rest the following day – a rule that is similarly true for non-athletes experiencing stress or fatigue as reflected by a low score – do less, rest more. So, while intriguing for athletes, unless you’re a consumer hyper-focused on heart health or getting into a workout regimen, simpler, more broadly sleep-oriented solutions like Beddit or the Nokia Sleep Pad may be more suitable. Otherwise, no other under-the-mattress sleep tracker offers HRV analysis and insights. Nokia Sleep Sensing and Home Automation Pad/Beddit 3, $99/$149.99 – As mentioned Beddit was one of the first into the under-the-mattress sleep-tracking space and as such has some refinements you won’t find in Nokia’s Sleep Sensing and Home Automation Pad. For instance, the Beddit 3 can track two separate sleepers while the Nokia Sleep Pad only tracks one. Nokia’s Sleep Pad does offer integration with IFTTT for a degree of home automation, though – something Beddit 3 doesn’t provide. Otherwise both of these under-the-mattress trackers off sleep stage tracking, smart alarms, snoring detection, heart rate, and sleep scores with nightly breakdowns. Neither offers much in the way of improving your sleep but Beddit 3 does allow you to enter keywords into a notes section to help assess and assign percentages to what factors contribute to better or worse sleep for you. Beautyrest Sleeptracker, $60.93 (originally $199.99) – This under-the-bed alternative has a more than amenable price, having been on the market for a bit now. Still, this tracker offers sleep stage detection, smart alarm, respiration and heart rate tracking, as well as sleep scores and short/long-term trend analysis. Some tips are offered for improving sleep within the app as well. Perhaps best of all, this tracker can support two different sleepers with two separate sensors providing in-app sleep data and analysis for both. The Beautyrest Sleeptracker also integrates with Amazon’s Alexa assistant enabling users to access sleep reports via the virtual assistant. Yes, Smart Pillows are a thing, and they can make a lot of sense too. The Zeeq Smart Pillow acts as both a sleep tracker and sleep influencer, while also throwing in some home automation features. Able to track sleep phases, duration, movements, snoring, and overall restfulness, the Zeeq Smart Pillow’s companion app gives user a day-to-day and long-term view of their sleep health, allowing them to recognize areas for opportunity. Unfortunately, the Zeeq Pillow won’t give you much info on how to improve your sleep, but rather offers its own unique solutions with its built-in features. Snore detection is its first line of defense against bad sleep. This works by gently vibrating when snoring reaches a preset level, encouraging the slumberer to change to a less airway-constricting position. 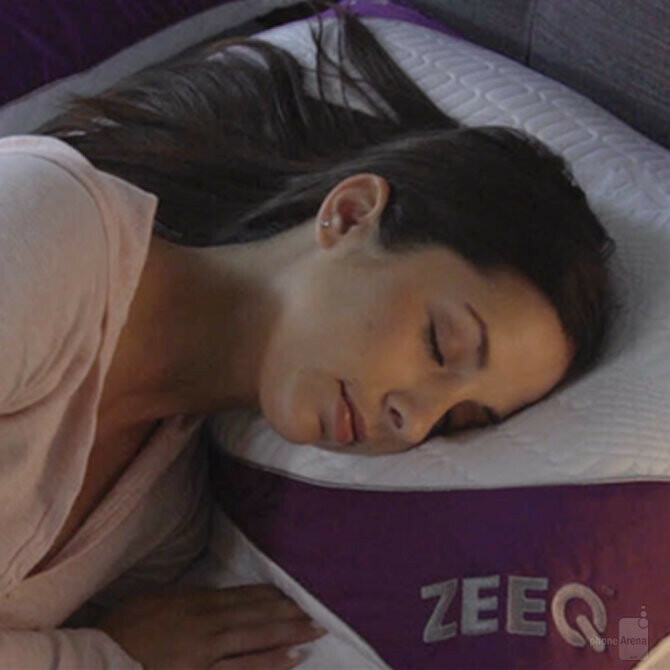 The Zeeq Smart Pillow also has eight built-in speakers which can connect via Bluetooth to stream music, audiobooks, white noise, or other sleep-aiding tracks. These can also be set to turn down and transition to other sounds or silence at a preset time. Lastly, this smart pillow offers a smart alarm, as many trackers do, to help ensure an optimal wake-up experience. Deeper, more physiological metrics like heart rate, body temperature, and respiration are measurements you’ll sacrifice in such a form-factor, though. Smart home compatibility adds another small perk by connecting with the popular automation app IFTTT for bedtime/wake routines, as well as Amazon Echo for reading out sleep reports and voice control. This pillow is rated at two weeks of battery life and is made of shredded memory foam, so it should be a comfortable, long lasting tracking alternative. Sunrise Smart Pillow, $159 Pre-Order ($300 MSRP) – Packing its own set of 21 different sleep sounds, the Sunrise Pillow can play music or various sounds, as well as guide users through breathing exercises and meditation. LED lights line the edges of the pillow which light up to simulate sunrise and wake the user “naturally” while also providing reading lights. Tracking includes sleep stages, and smart alarm but like the Zeeq Pillow, lacks physiological trackers like heart rate, body temperature, and respiration. Wrist-worn trackers are among the most popular and widely used methods of sleep tracking due to their ease-of-use and the fact that most activity trackers and smart watches have some kind of sleep tracking built in. The depth and insightfulness of each of these varies but most cover the basics: sleep duration, sleep stages (some track REM, some don't), and overall sleep efficiency. None of these do much to give you tips on improving your sleep or diagnosing sleep issues, and that’s where EverSleep comes in to pick up the slack. While devices like EverSleep can't be regarded as official medical equipment, and as such can't give official diagnoses, the EverSleep tracker does all that it can to help you identify and even rectify your sleep issues. Among the issues EverSleep is trained to identify and help remedy are insomnia, breathing interruption (sleep apnea), snoring, and fragmented sleep (waking up often). Utilizing a fingertip heart rate monitor, infrared O2 measurement, and the obligatory accelerometer, EverSleep informs you of wake occurrences due to increased brain activity (determined by your heart rate and often due to stress, caffeine, or other external factors) instances of lowered blood-oxygen levels (apneas), and, of course, an overall picture of your sleep efficiency. Best of all, Eversleep gives you much advice and insight on what's affecting your sleep at night and how to help remedy it. If symptoms don't improve over time, the app may recommend you consult a doctor about your specific sleep ailments. Personalized advice for general sleep hygiene and efficacy is also included. All graphs, charts, and insights are easy to understand, whether it be to provide a snapshot of your O2 levels throughout the night, or an analysis of the sleep stages you went through. For $200, the EverSleep sleep tracker gives you all the sleep-tracking features of popular activity trackers and a good deal more, enabling users to not just track their sleep but improve and diagnose it, if necessary. Misfit/Fitbit/Samsung Gear/Android Wear/Apple Watch $29.99 - $1000+ – all but the Apple Watch offer automatic, native sleep tracking with proprietary algorithms and companion apps with which to view your data. Metrics include sleep stages, sleep duration, heart rate (with capable devices), and overall sleep scores. The Apple Watch requires third-party app installation to support any such features, though, and none of these trackers attempt to diagnose or fix sleep issues or disorders. Conclusion – What’s the best? So. Now that you’re well-educated on all the different approaches and possibilities, which one is the best? As you might’ve already anticipated, the answer to that isn’t so straight-forward. A lot depends on what fits your lifestyle and that which afflicts your sleep. If you think you may suffer from sleep apnea, insomnia, or a related disorder, EverSleep may be your best bet for useful, actionable insight and solid sleep tracking. If you’d rather not wear a device the SleepScore Max may be the next best thing, due to its focus on respiration and movement. Athletes rejoice – the EMFIT QS+ ACTIVE is here to gauge your work and recovery, and it slips right under your mattress. Those concerned with their heart health and overall wellness can also benefit from this device with its analysis and tracking of the deeply health-related heart-rate-variability score. Of course, for you more casual sleepers who think perhaps white noise and some (literal) nudges in the right direction might do the trick, smart pillows are here to make you comfortable, improve your sleep, and of course track it. If you’re really serious about improving your sleep and expense is secondary, then the Dreem Headband, Neuroon Open, and Sleep Shepherd are all great examples of EEG-enabled equipment which leverage their readings to improve your sleep quality in the moment, and of course track it meticulously throughout. Suffice it to say, your options are more diverse and possibly even more useful than you thought they ever could be. My advice? Pick a device, go forth, and rest well! There's another sleep tracker I've heard of where all you need is a warm bowl of water you put it next to your bed and as you fall asleep you put your hand into it this soothes you as you go to sleep and keeps you asleep for longer.